Finally made something! I've actually been working on this layout for a few days but have been pretty lazy about getting it done. 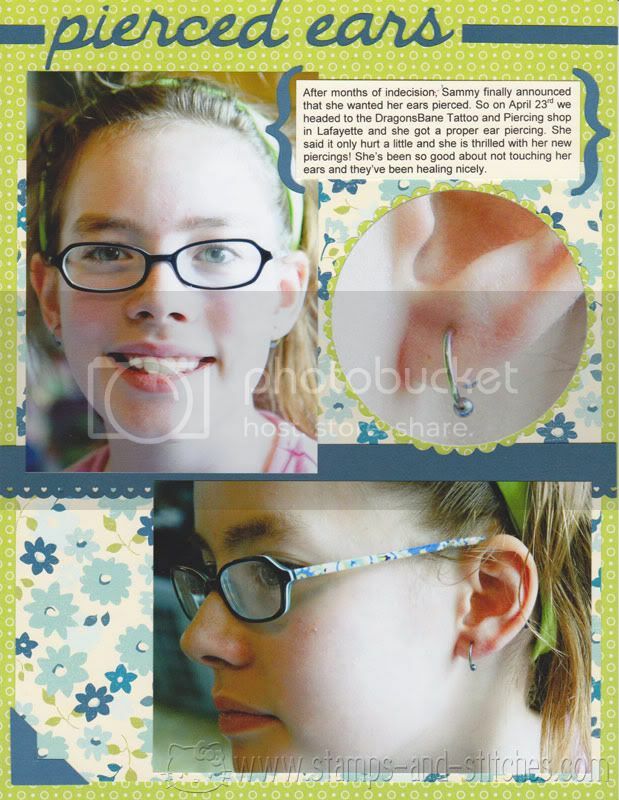 I took these pics about a day or two after my 12 yo had her ears pierced. Great page! Love the colors you used, they match her glasses perfectly! Love the layout! I really love your color combo! Great job on this! Great page!!! I love the layout, and the colors are perfect! And I must say, your daughter is so cute! Although I know at that age, she would not want to hear that. So, tell her I said she's beautiful! I love that title! Cannot believe it is from cursive 101! I guess I thought it would look more "school-ish" than it does IRL. Darn, another one I might "need"! BTW, I did laugh when I read where you had her ears pierced! I was just thinking a Claire's or something. How cool you did it at a tattoo/piercing place. Never would have thought to do that...great idea! Congrats on your DD's big decision and I love the papers you have used! And just have to say that I think your taste in Vampires is just fine, after all he is a very lush evil vampire. Very cool page for a sweet-looking girl! Love her glasses too!